Your browser does not support inline frames or is currently configured not to display inline frames. Click on this link to display a standard frames page. On the left-hand side of the screen, you will see a list of rose names. 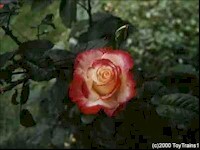 Click on a name to display the photo(s) and information relating to that rose. The abbreviations following the rose name indicate the rose type: (HT) = Hybrid Tea; (S) = Shrub; (LCl) = Large Flowered Climber; (Gr) = Grandiflora; (B) = Bourbon (Old Garden Rose); (P) = Portland (Old Garden Rose); (*) = deceased. I've begun to keep a journal about the roses and the garden. You can peruse it at the following link. There are a number of web sites that I enjoy visiting; I think you might like them too! The following link will take you to my page of Rose Links. Over the years, I've built up a small collection of rose books. The following link will display the contents of my collection. It's in .PDF format.